Invitation Etiquette-Who is the Host? Ever wonder why some wedding invitations start out with the bride and groom’s names printed at the top and other invitations list the parents of the bride at the top? So what’s the deal... whose names should be printed first? Figuring out who the “hosts” of the wedding are is important for couples to consider when selecting wording. In many cases, the “hosts” of the wedding are the bride’s parents. A major factor of figuring out the “host” is establishing who is shouldering the majority of the financial burden of the wedding. The role of “hosts” has typically fallen to the bride’s parents, but now it is not uncommon for multiple sets of parents or the bride and groom themselves to be the “hosts” of the wedding and therefore listed first on the invitation. It can get tricky when parents and the bride and groom are participating in the finances and even trickier when multiple sets of parents are involved. Use your best judgment on what suits your situation and talk to your family about their preferences. In any situation, we recommend that the engaged couple be as considerate as possible to those who are helping in the nuptial plans and err on the side of being gracious and appreciate the love and support of your family and friends. In the pictures are some examples of the different wording guides you can use. Starting with the top left corner is an example of a hybrid format invitation. This is where you have the bride’s name then the groom’s name, saying along with their parents. Then all parents names starting with the bride’s. In the top right corner is and example of a parents announcing invitation. Parents announcing format invitation is most common. This is where the bride’s parents are named and then say something to the effect of “are pleased to announce the marriage of their daughter” then you have the bride’s name followed by the groom’s name and his parent’s names. The bottom left corner is an example of Bride and groom announcing invitation. This would be where the bride and groom announce them selves starting with the bride’s name first followed by the groom and saying something like in our example “you’ve shared in our lives with your friendship and love now we invite you to celebrate the beginning of our new life together”. 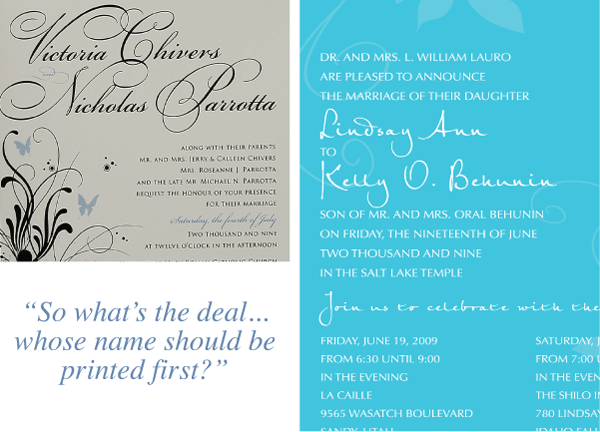 In the bottom right corner is another example of a hybrid announcement where the bride and groom have named their parents at the bottom of the invitation. For more details you can refer to our wording guides resource.